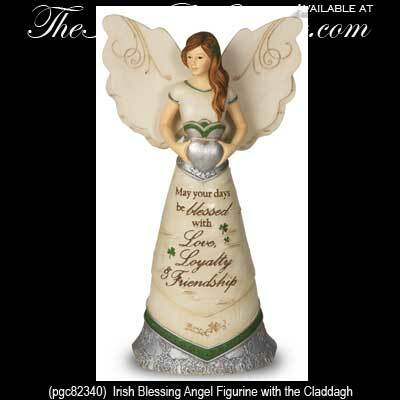 This Irish angel figurine features the Claddagh and shamrocks along with a blessing. Sorry, this Irish angel is out of stock. The blessing on this Irish Angel says: May your days be blessed with Love, Loyality & Friendship. This Irish angel is holding the Claddagh and is enhanced with shamrock accenting along with and Irish blessing. The Irish angel figurine features a colorful resin design and measures 6 1/2" tall with a 4" wide wingspan; she also has felt pads on the base. The Irish blessing angel is gift boxed with Claddagh and shamrock history cards, compliments of The Irish Gift House.